Life at HiS HOUSE from the point of view of our House Moms! During the heaviest days of the MLO, the population at HiS House ranges from 20-30 people. Managing the household gets a bit harried, as you can well imagine! Sharon Beal and I (Kim Cissell) do the bulk of the house-tending during those busy days. This encompasses all you might expect: grocery shopping, arranging meals, preparing rooms for incoming members, floors, laundry, etc. Dishes are done by hand so everyone pitches in - we go through dish towels at breakneck pace! There are now 2 washing machines so we keep the clotheslines full of drying clothes, sheets, and towels. The four bathrooms are cleaned every morning, floors swept and mopped, HiS House kept comfortable and welcoming. 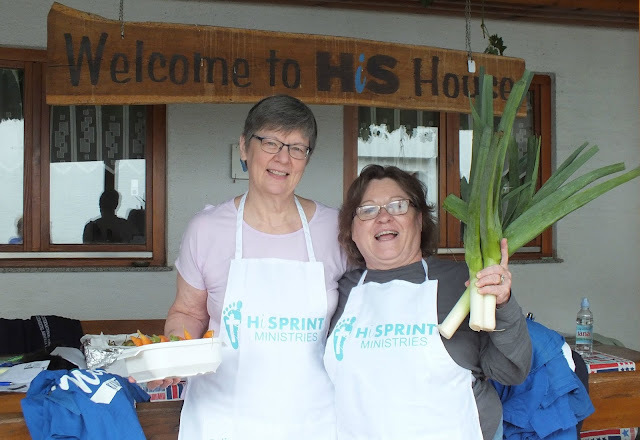 The work Sharon and I do enables the other team members to head out to ministry each morning fed, rested, and in clean clothing. They come back to HiS House tired and hungry, to find food and rest ready and waiting for them. Just like coming home...and that is our intent. But do not think that Sharon and I spend all of our days drudging it out over floors and food. We aren't unhappily slaving away - not at all! We participate in any activity any time. Trips to the Saturday market are lots of fun. We go get ice cream at MouseMan's just like everyone else. This year Sharon and her husband Rock created a fantastic program about NASA, presented at the Petrinjia Library. The local radio show was there, taking pictures, and interviewing Rock afterwards! I read a poem in Croatian for the librarians there, much to their delight. One delightful part of our job is that after the team group leaves in the mornings, Sharon and I have time to get the morning work done and then take naps. We are very good at that, too!